In this session, I look at the material covered on the second quiz, ranging from how to estimate the cost of capital for a project to how best to arrive at the incremental cash flows and time weight them. Get the entire 10-part series on Seth Klarman in PDF. Save it to your desktop, read it on your tablet, or email to your colleagues. This is the interview for the second quiz and essentially uncovered the material which we've done since the first quits. Simply put these are the three skill sets I'd like to be able to bring into the quiz. The first is whether he can compute the cost to get per project not just for Ferb and that requires estimating the cost of equity and deciding what dead trees should use on a project. The second is to come up with the cash flow as an investment. So you have to understand the difference between earnings and cash flows that differed from an equity cash flows. How do depreciation affects the cash flows and why we care about working capital. You also have to understand the difference in something that's incremental and something that's not wide plays out. And finally you're going to be able to convert the cash flows you have to a measure of time weighted return and PBR are if you're looking at a stand alone project. But if you're comparing across projects can you compare net present value across projects with different risk and different livestock's. So quite a few takes to go. Let's start with the cash flows the cash flow for a project or business can be estimated one of two ways it can be estimated before debt payments. And that's called cash flow to the firm. So it's a predict cash flow or it can be estimated after debt payments interest payments and principal payments. That's called cash flow equity. Why does that matter. Well the discount rate is going to be different depending on how the cash flow is computed as to how the cash flow is actually computed it's a three step process. 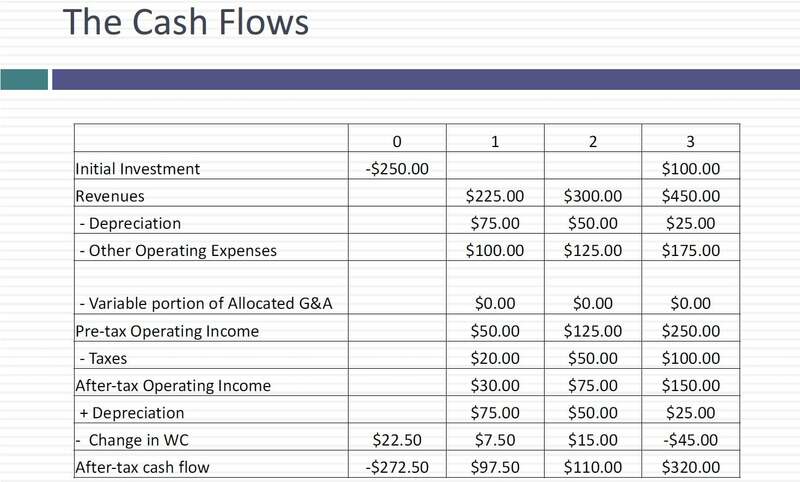 You start with accounting earnings and but it's net income or operating income we're depending on whether you're doing equity cash flows of cash flows you add back depreciation or non-cash charges. Why because in accounting expenses that lowered your income you subtract out capital expenditures if you have a habit and if you have a project it might be that you don't have any. Once you made that initial investment and then you subtract out change in working capital to get the cash flow said are one additional step your debt repayments you've got to show those cash hold cash flows as well and you can get cash flows to equity. So let's take a simple example from a few quizzes ago. So investment that Nova Chemicals is making the initial investment is 250 million you're given revenues depreciation and operating income for the next three years and you're given the three line items depreciation or other operating expenses and allocated GNN. So I've given you the pre-tax operating income each year for the next three years the Metro curve it do I say I say this particular problem all of the alligator Annaik cost is fixed and that you will have to invest 10 percent of the expected revenue each year in working capital at the start of the year. Key word started the year. That's what affect the timing of the working capital at the end of three years you expect to get the remaining book value back about both your initial investment and the working capital investment over that period so estimate the expected after tax cash flows. Notice I'm not asking you to estimate the net present value just estimate the after tax cash flows assuming a 40 percent marginal tax rate. So let's get started in your zero which is really time zero you have your initial investment 250 million. Your revenues are given and the prom you subtract out the depreciation and you initially Organum on the investment which is going to be 75 15 24. Also given the profit you subtract out other operating expenses but remember you're told deallocated DNA is all fixed nothing to do with the project so send it to zero the pre-tax operating income you now have is really the incremental pre-tax operating income in this project. You apply the 40 percent tax rate or if you get a 40 after tax operating add back the depreciation because remember it's non-cash expense. And here is where the Twisden this problem comes about. There's a working capital that changes each year as a percent of revenues it's 10 percent of revenues 10 percent of your wine is twenty two point five million dollars. I showed in your story saying what. Remember that the investment in working capital happens at the start of the year the start up year one is actually right now so I'm showing it and user. Now what happens in your do my working capital goes to 10 percent to 300 put Sturdevant. Why isn't 30 million showing up. Well because I've already got twenty two point five million invested. I just saw the change in working capital which is seven point five million in year in year one. Then you get to your 2. I think the change in working capital from year to year 3 which is 15 and showed that as the cash flows are 22 7 twenty two point five seven and a half and 15 collectively you've invested 45 billion dollars of working capital. Now what happens at the end of the three you wrap up the project you get your salvage value and your equipment back which is 50 million dollars you ought to get the working capital back because that state and the cash flows in your tree are augmented by those two Cashen plus I've got my cash flows every year. Now as you look at this from your you know think about how working capital plays out it's just the change in working capital that affects the cash flow will come back into another Pramad working capital.